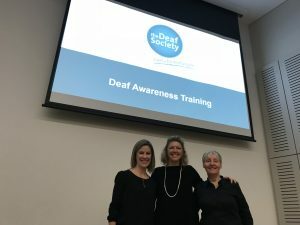 With the kind support of the Cochlear Macquarie University Partnership, the Australian Hearing Hub and Children’s Services at Macquarie University, a two-hour Deaf Awareness Training session was held at Macquarie University Campus on Tuesday 4 September. The course is part of a range of services The Deaf Society offers to increase awareness and provide specialist services for deaf, deafblind and hard of hearing people and their families. Learn how to communicate in a culturally appropriate and sensitive way using your clients preferred visual communication style. Demonstrate culturally appropriate ways of interacting (eye contact, turn taking, gaining attention). Begin learning and building a visual vocabulary related to daily life. Engage in simple exchanges in Auslan or visual communication. Giving and following simple instructions using visual communication. What is the difference between deaf and hard of hearing people? What are the different communication methods used by deaf people?